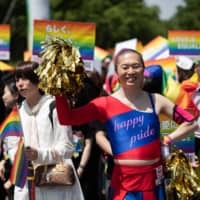 Although Japan’s defense policy appears to have taken a new twist with a decision to deploy an aircraft carrier, doubts remain over whether the plan will best serve its national interests as the nation struggles with what it views as a growing threat from China. Possessing an aircraft carrier has been controversial in and outside the country in light of its militarist past and the pacifist postwar Constitution, which restricts the nation from possessing what some have deemed as clearly offensive armaments. Despite this, Prime Minister Shinzo Abe’s government waded into the fray Tuesday by endorsing a new five-year defense buildup program that includes a plan to transform existing Izumo-class flat-topped helicopter carriers into ships capable of launching short takeoff fighter jets. The government has apparently sought to shrug off concerns that it is seeking new defensive capabilities that might exceed constitutional limits, with officials insisting the upgraded helicopter carriers would not have the means to inflict “devastating damage” on another country. “This measure is to reinforce our air defense system and it is within the minimum necessary level of forces our country is allowed to possess,” Chief Cabinet Secretary Yoshihide Suga said at a news conference Tuesday. The government has also said it has no intention to keep fighter jets assigned to the vessels at all times, and stipulated in the defense buildup program that the Izumo-class ships — even after the upgrades — will remain as “multifunctional destroyers” that engage in missions ranging from patrolling to large-scale disaster response. The Maritime Self-Defense Force has two 19,500-ton Izumo-class ships, which are the country’s largest postwar naval vessels, with an overall length of 248 meters and each capable of carrying up to 14 helicopters. For fighters to take off, the deck may have to be coated with heat-resistant material, among other modifications. Some defense experts have echoed the government’s view that refitting Izumo-class ships, in itself, will not make them highly offensive, given that each will only have the capacity to carry some 10 F-35B stealth fighter jets, which Japan plans to introduce as the aircraft are capable of short takeoffs and vertical landings. 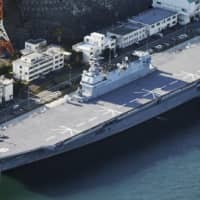 “Compared with China’s (first) aircraft carrier, the Liaoning, capable of loading some 20 fighters, or 100,000 ton-class U.S. carriers, capable of transporting about 50, Izumo would be too small to use for offensive operations,” said Noboru Yamaguchi, vice president of International University of Japan in Niigata Prefecture. But the retired Ground Self-Defense Force lieutenant general said the presence of Izumo ships would be useful in beefing up defense over far-flung islands in the southwest, including an area where tensions remain high over the Japanese-controlled Senkaku Islands, which China claims and calls Diaoyu. “The moves of Japanese aircraft will become increasingly unpredictable for the Chinese if they can take off from carriers in waters around the southwestern islands (rather than leaving from fixed bases),” he said. Other experts, however, have criticized the government’s arguments as mere rhetoric. “The modified Izumo ship will obviously be an ‘aircraft carrier’ (in violation of the Constitution) as long as it can launch fighter jets to attack opponents,” said Hideki Uemura, a professor at Ryutsu Keizai University. The important point is how the plan will be perceived by other countries, and the latest move may provide an excuse for China to take a tougher stance against Japan, according to Uemura, an expert in international politics. “I think the conversion of Izumo is not only useless in terms of military purposes, it could even provoke China,” Uemura said. 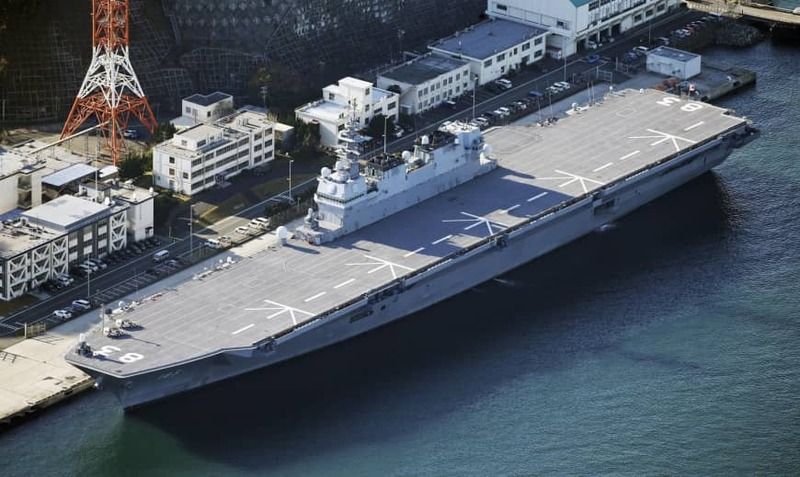 Kyoji Yanagisawa, a former Defense Ministry bureaucrat, expressed disappointment that the aircraft carrier deployment plan appears to have been given the green light without sufficient debate on what functions the vessels should have, as well as their purpose. As a result, Japan may end up just having “floating runways” that may not be useful for substantial missions, including defending remote islands. 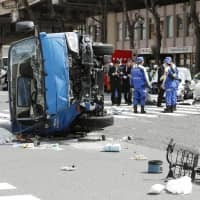 “It could be just a waste of money,” said Yanagisawa, who now serves as head of International Geopolitics Institute Japan. Following through with the plan will also likely push up the nation’s annual defense budget, which has continued to exceed ¥5 trillion in recent years. Purchasing U.S.-made F-35 fighters for use on the carriers will also be costly, since each is said to have a price tag of around ¥10 billion. Yanagisawa and Uemura both warned of the possibility that the upgraded Izumo-class vessels could also be mobilized to support U.S. military operations in the future, as the United States and Japan continue work on strengthening their alliance via contentious security legislation that expanded the scope of the Self-Defense Forces’ operations.